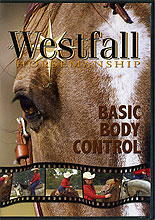 In this DVD, Stacy teaches basic body control exercises that all horses and riders should master. These exercises will help build a solid relationship by gaining control of the horseâ€™s movements while instilling trust under saddle. Multiple lessons using horses with varying levels of training. Mastering these lessons will help keep you safe under saddle. Recommended as essential training for horses and owners, regardless of skill level. Stacy Westfall, of Mt. Gilead, Ohio, is no stranger to the competition arena. She was the first woman to compete in and the first woman to win Road to the Horse--showcasing her horse training methods. Stacy is also a winner in the reining show pen. She's best known for her "mystery-rider" bridle-less freestyle ride. In 2003, National Reining Horse Association Futurity fans leapt to their feet after her bridleless ride rated tops with the judges. Stacy dressed in a dark trench coat, black hat and bandana to cover her face. She won without reins--and without so much as a neck rope. In 2005, Stacy won six key reining events without reins--including runs at Fiesta in the Park, the NRHA Eastern Affiliate Championship, The Tradition Freestyle Open, the Tulsa Reining Classic, the All American Quarter Horse Congress, and a repeat win at the NRHA Futurity. She repeated her Tulsa championship in 2006--without a saddle or bridle. Growing up in Maine, Stacy rode any horse she could find. She started riding on a Shetland Pony named Misty who was trained to rear on command. Stacy trained her first colt at 14--a $150 project horse. She attended every clinic and read all she could to teach herself the art of colt starting. At college in the University of Findlay's equestrian program, Stacy rode with top trainers such as Dan Huss and AQHA Professional Horseman of the Year, Clark Bradley. She also trained with Rusty Dare and Mike Flarida. Still, Stacy's daily inspiration and life-long training partner is husband Jesse--himself a well-known reining trainer and NRHA judge.